For more articles about (Lean) Six Sigma, use the drop down menu in the top left corner. This is the introductory article about Lean Six Sigma, another article introduces Six Sigma! Lean Six Sigma combines two lines of approach for business process improvement: logistics and quality management. While Lean Manufacturing is used to improve the flow and to remove unnecessary production steps, Six Sigma is used to improve and standardize the quality of the remaining steps. The result: more efficient ánd better production, for example manifesting itself in the form of reduced delivery times in combination with improved quality. Quality is an important, measurable and distinguishing feature (the field of application of Six Sigma). Really different organizations meet this profile! Lean Six Sigma is for example applied by chemical companies such as Shell (see the article below) and SABIC Innovative Plastics, but is also practiced within hospitals, such as the university hospital of Groningen in the Netherlands (UMCG). Initially, Six Sigma was dominating in Lean Six Sigma. In DMAIC-projects, lead by Black Belts, Lean-tools like Value Stream Mapping were then only applied when needed. Today, there is an increasing appreciation for the people part of Lean. Examples are frequently visiting the shop floor as a manager (Go to the Gemba), visual management, and the formation of teams that improve their own way of working. An example of a company that applies Lean and Six Sigma in a more balanced way, with both methods being equally important, is Philips. By Dr Jaap van Ede, business-journalist, editor-in-chief business-improvement.eu. Shell Chemical Netherlands (SCN) aims to optimize its business processes end to end. Key Performance Indicators are used to measure to what extent this goal is achieved. When a certain process performs under par, Lean Six Sigma is used to find and tackle the root cause of the problem. 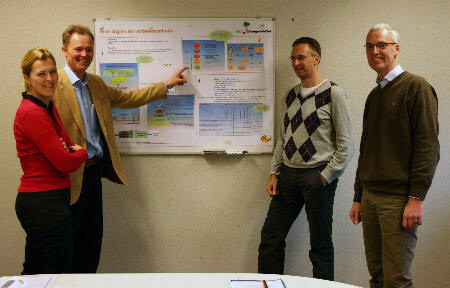 Between 2004 and 2008, Shell Chemical Netherlands (SCN) saved as much as 30 million Euro with the aid of Lean Six Sigma! Central point in this method is a fixed project cycle with the phases Define, Measure, Analyze, Improve, Control. This so-called DMIAC-cycle results in increasingly efficient and perfect processes, see also the box DMAIC-cycle connects Lean en Six Sigma. Because further improvement always remains possible, this cycle never stops! The chemical plants of Shell at Moerdijk in the Netherlands form a network. Local optimization therefore doesn’t make much sense! Lean Six Sigma matches well with the idea that processes should be optimized end to end. 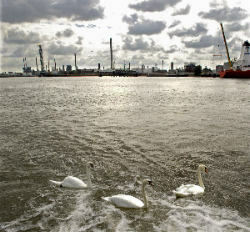 The factories of Shell at Moerdijk and Pernis in the Netherlands form a network of vessels and columns. Therefore it doesn’t make much sense to optimize one unit, without taking into account the effects on adjoining activities. This does however not only hold for production, but also applies to all supporting business processes. This leads to the following conclusion: To make a company perform optimally, all production, business and management processes should be mapped, end to end. Next, Key Performance Indicators should be defined for each process, so that it becomes measurable how efficient this process runs. Shell calls this unit and department exceeding approach “process (oriented) thinking”. Lean Six Sigma combines two improvement methods. Theoretically this will result in processes which are not only efficient from a logistic viewpoint (Lean), but which also deliver products or services of good and standardized quality (Six Sigma). Lean Six Sigma connects Lean and Six Sigma via the DMIAC project-cycle, which is a concept borrowed from Six Sigma. DMAIC stands for the project phases Define (what is important in the eyes of the customer), Measure, Analyze (why is quality sometimes below standard), Improve and Control (prevent a return to the old process). By repeating this DMIAC-cycle, the process concerned becomes increasingly efficient (Lean) and perfect (Six Sigma). Lean manufacturing reduces waste in time and materials, which results in increasingly efficient (logistic) processes. Only steps which add value for customers are considered to be useful. A process flow diagram (Value Stream Map) is used to identify which processes add value, and which don’t. Seven kinds of wastage are reduced as much as possible: overproduction, inventory, manufacturing errors, manufacturing disruptions, waiting times, transport and unnessary movements. Six Sigma adds the striving for a constant and good quality of business processes. This is done by a reduction of variation. The goal is to maximize the likelihood that products or services will meet customer expectations. The term Six Sigma refers to an error probability of only 0.00034%! To bring the process management within SCN to a higher level, the “Change to Win” initiative was launched in 2004. Change manager Hans Boerstra: "We aim to optimize business processes end to end. Six Sigma fits perfectly, because DMAIC-projects are done by multidisciplinary teams. That way, local optimization is prevented"
Last-but-not-least: Six Sigma puts the needs of the customer first. The goal of each DMAIC-project is to improve those quality aspects which are seen as critical in the eyes of the customer. The persons interviewed for this article. From left to right: Black Belt Nicoline Eikelenboom, Change Manager Hans Boerstra, Green Belt Joep van Giezen, Yellow belt Cees Knook. Six Sigma came into the public eye, after Jack Welch implemented this method with big success within General Electric (GE). Value Stream Mapping identified which activities in the laboratory at Moerdijk add value, and which don’t. Cees Knook is manager of the laboratory, that carries out analyses on behalf of the production sites in Moerdijk. Knook tells about a DMAIC-project in which he was involved as Yellow Belt, in the role of project owner. In this case, the focus was on Lean: Value Stream Mapping was applied to identify which activities in the laboratory at value, and which don’t. By relocating popular analyzing equipment to central positions, waste in the form of ‘walking’ was reduced. 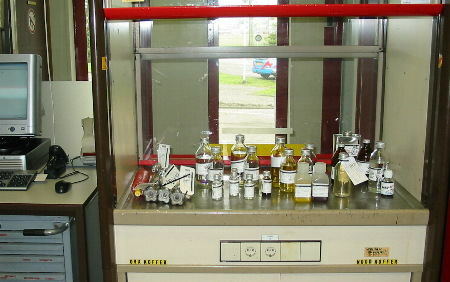 Besides that, a two-bin system was introduced for the chemicals, with one bottle in use and one in reserve. On the last point there is an overlap with a DMAIC-project in a totally different business department, namely shipping. Nicoline Eikelenboom was, as a novice in process improvement, involved in this project as yellow belt. ‘I liked Six Sigma so much, that I am a Black Belt today’, she tells enthusiastically. 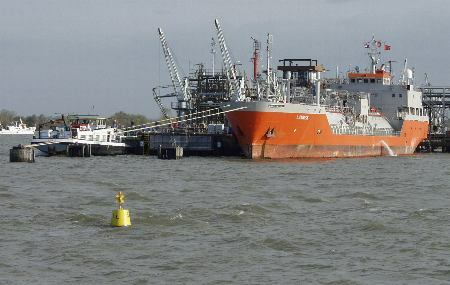 In Moerdijk, the lion’s share of the thirty bulk chemicals are supplied and/or removed by boat. That fact is important, since the space at the quay increasingly became a bottleneck. ‘On one hand, there is an increasing demand for transshipment capacity. On the other hand we saw that the efficiency of that process was deteriorating. As a result, our expenses for harbor dues were increasing. In the long run, it would even become possible that timely supply of raw materials to production couldn’t be guaranteed anymore’. Therefore a DMAIC-project was started, to answer the following question: Is an investment in the construction of a second quay necessary, or is it possible to make better use of the existing quay? In the end, the latter option turned out to be best. To come to this conclusion, measurements again formed the point of departure. It became clear that there was a need for a cultural change. From now on, everyone should have to strive for transshipments as quick as possible. A DMIAC improvement project, aimed at more efficient transshipments, proved that investment in a second quay was not necessary! Each team not only maps what can be improved, but also implements their findings, and finally secures that a return to the old situation becomes impossible. 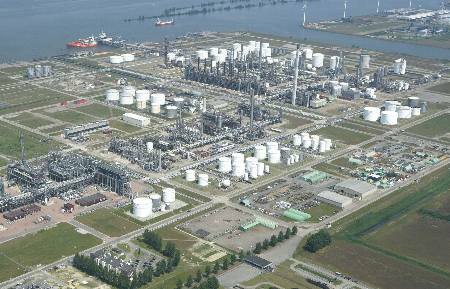 Within Shell Chemical Netherlands, 92 DMAIC-projects started in the last three years. Half of these is finished already, with savings of 30 million Euros as a result! To make Lean Six Sigma a durable part of the company culture, a critical mass is needed of 1% Black Belts, 5-10 % Green Belts, and 25-50% Yellow Belts. ‘So we need a considerable number of extra Belts in the future’, Boerstra admits. Besides that, inspired management is of crucial importance. Third, business priorities should always come first. ‘In addition, it should remain attractive for employees to work on Six Sigma improvement projects’, Boerstra says. Joep van Giezen participated in a Lean Six Sigma project, with as goal to reduce the number of concentration-overruns in wastewater. Giezen is assistent department manager of the solvent plants of Shell Pernis. What does the complete process look like, from the origin until the discharge of wastewater? In what way is it possible to get grip on that process? The data-driven approach of Lean Six Sigma turned out to be perfectly suitable to solve these questions! Wastewater purification is a biological process. Therefore the concentration of organic substances may not exceed a certain limit, which is called “chemical oxygen demand” or COD. This lead to the following conclusion: There was a need to record incidents better! The new approach bears fruit. Since the introduction of the water management tool, the number of COD-overruns was reduced by 50%!